HUNTINGTON, WV - Two former Thundering Herd women’s basketball players are now making professional careers for themselves in Europe, as they continue to carry-on the work ethic, skill, and discipline that has seen them progress from Marshall athletes to overseas professionals. Both Tynikki Crook and Chantelle Handy made the trek across the Atlantic following the conclusion of their Marshall careers and have made a name for themselves while doing the one thing they’ve known for so long: playing basketball. Crook, a Detroit, Mich. native and former 6-1 forward for the Thundering Herd is currently a rookie with Gernika, a Spanish team located in the country’s Basque region. She featured in the team’s first ten games of the year, and is currently averaging a team-leading 15.8 points and 8.7 rebounds per match. In the season-opening match, Crook returned from a preseason ankle injury and contributed a season-high 25 points and 9 rebounds. Meanwhile, one of her former teammates is enjoying success in another part of Europe. Handy joined the Greek outfit, Athinaikos, at the beginning of September and has signed a one year contract with the team. The former 6-3 guard from Durham, England played four years for Marshall, and helped account for 63 wins, 984 points, and 585 rebounds in her career with the Thundering Herd, and is looking to build upon her basketball success with her new team. 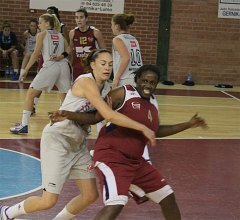 Athinaikos is the third team Handy has played for in the past two years, as she spent last year with both the Greek-based Aris, and the Slovakian side MBK Ruzomberok. So far to date this season, Handy is averaging 13.4 points per game, and has helped lead Athinaikos to a 9-0 record for the season. Recently, Handy has also featured for the Great Britain national team, playing for them in the European Tournament this past summer and in the recent Olympic qualifiers. 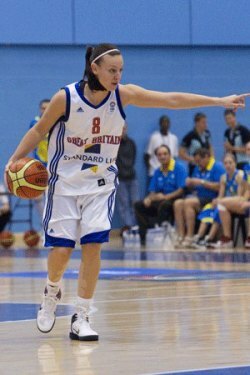 She is hoping to be a part of the Great Britain squad that will participate in this summer’s Olympic Games. To follow Crook and Handy’s progress in the European professional leagues, be sure to visit www.eurobasket.com.